Do you want your business’ fleet vehicle to get noticed no matter where you drive around? Obviously, the answer in your mind is a resounding ‘yes.’ but the question really lies in how you can get creative with your mobile advertising. We suggest taking a play out of Bahama Buck’s book for a successful marketing move. Recently, the Texas-based company has implemented a vinyl vehicle wrap that has quickly become a successful move in their advertising and marketing efforts. Bahama Buck’s first hit the local scene in the summer of 1990. The business specializes in creating sno cones and smoothies that bring a taste of paradise to the Dallas Metroplex. The business started out small with a single ice shaver and eventually became a tropical sensation, offering menu items that represent a classic style and the sensation of drinking a tropical drink seaside. Although their menu boasts the “Greatest Sno on Earth,” Bahama Buck’s is always looking for ways to get their brand out to the community. One way they have implemented this is a service where Buck’s comes to your event and brings a piece of the tropics to you. Instead of simply slapping a brand name on the side of their truck and trailer, the management at Buck’s decided to kick up the marketing to a ten. Check out the awesome wrap design that SkinzWraps and Bahama Buck’s were able to create for their mobile advertising. When Bahama Buck’s approached us with the idea of wrapping their vehicle, we were all in agreement that the design had to truly showcase what the business is about; this is vibrancy, coolness, and delicious. Just looking at the turquoise, orange, and white wrap instantly brings to mind the taste of a luscious sno cone or fruit smoothie. Keep in mind that although this is a standard truck wrap, the design is one that not only pops, but showcases some visual menu items and a simple display of contact information. How Can a Vehicle Wrap Impact Your Local Business? 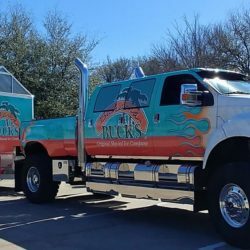 The Bahama Buck’s truck and trailer wrap is one that has helped to boost the success of an already thriving local chain. But what if your business is newer or smaller? How can a vehicle wrap help you succeed? And promoting new items or specials. All of this and more is possible when you wrap your company cars up with a message that pops! Get Your Brand Noticed With Help From SkinzWraps, Inc. If you are ready to take the next step in upping your business game, a vehicle wrap is a great way to stomp the competition. At SkinzWraps, Inc. we specialize in designing and applying vinyl wraps to even some of the most complex vehicle types. Contact us today to find out how we can wrap your commercial vehicle into perfection.